The relationships that exist within a channel ecosystem are complex and diverse with vendors and channel partners largely dependent on one another for success. In channel marketing, global brands often rely on thousands of channel partners to market and sell their solutions to local markets around the world; these same channel partners often manage many different brands and relying on brands to provide them with relevant content to influence buyers in their local markets. With such a diverse and complex landscape, it’s essential that brands have a clear channel marketing strategy and the right supporting technology in place to manage their channel network and market successfully through their channel partners. This is where The 5 C’s of Channel Marketing comes into play. The 5 C’s is a strategic Channel Marketing framework which clearly outlines the five critical stages of partner engagement and marketing across partners. This framework (depicted below) has been used in tandem with StructuredWeb’s innovative technology to drive some of the largest, global channel programs to new heights of success. The first stage of a successful channel marketing strategy involves the capability to create strategic marketing programs through effective content and efficient processes. Efficient channel processes require scalability: When dealing with large channel networks, scalability becomes critical to financial success. Vendors need the capability to provide relevant content to all of their channel partners in a scaleable way. This can be done through a partner marketing portal, like the StructuredWeb platform. Without scalable solutions to content deployment, the time and resources required to provide relevant content to each channel partner marginalizes ROI. Effective content requires customization: For partner engagement, it’s imperative that vendors not only provide partners with content which clearly communicates their solutions to end customers, but also that partners find the content relevant and valuable. From a partners POV, relevance often requires that content can be adapted to the native language of local markets, so translation capability is key. Value requires that content also represent the partner business, so the ability to co-brand assets is crucial. For vendors, it’s fundamental to provide partners with marketing content in a scalable way- BUT if that content can’t be translated and/or co-branded, it will likely go unused or it will be used ineffective to local buyer markets. Partners aren’t marketing experts and partners needs are diverse. The StructuredWeb platform connects vendors to all of their channel partners under one central hub and simultaneously enables vendors to provide each channel partner with the right level of marketing support by connecting them to the assets, tools and resources they need to execute marketing successfully. The idea behind channel marketing is to leverage partners’ local connections to amplify reach to end customers. With the correct level of support and access to the right material and tools provided through one central platform, this goal is easily achieved. Channel marketing relies on the ability of brands to effectively communicate the solutions through channel partners to end customers. In today’s digital B2B world, buyers are more advanced and relying on e-mail to communicate solutions simply won’t cut it. 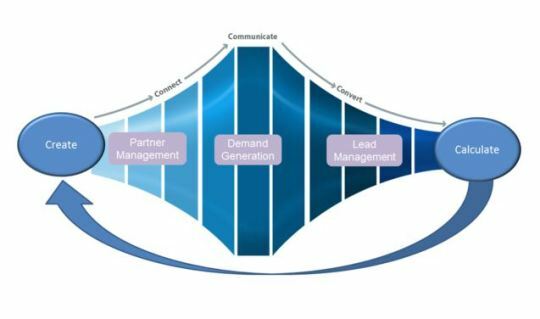 Vendors must enable partners to communicate their solutions through a highly integrated, multi-touch marketing strategy which matches the customer’s buyer journey. On the StructuredWeb platform, this capability is enabled through access to a suite of over 18 integrated marketing tactics and intelligently automated marketing systems, enabling consistent, effective communication with end customers. Once awareness has been created, the right tactics must be in place to help partners capture leads and nurture them through the sales funnel. Advanced lead capture tools, automated lead distribution and intelligently automated nurture streams help convert more leads into opportunities and drive channel sales. Essential in any channel marketing strategy is performance feedback and track-ability. With comprehensive reporting and real-time analytics, brands can calculate performance at each POI throughout their channel, supporting strategic decision making and driving ROI. The StructuredWeb platform fully supports the 5 C’s framework outlined above with smart solutions and innovative technology at each critical stage of channel marketing. Interested in learning more about about the 5 C’s? Watch our 5 C’s webinar to delve deeper into the best practice tactics, tools and strategies industry leaders are using at each stage of channel marketing to drive channel sales and optimize ROI. Click here to connect with one of our channel marketing experts and see how our solutions come to life to simplify channel marketing and drive channel sales for global brands around the world.